Parliament Hill is a place for decision-making, but also a place for people. Visitors can tour some of the buildings, watch Parliament in action, and enjoy ceremonial spectacles like the Changing of the Guard ceremony. 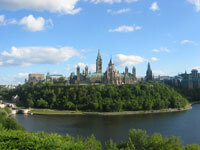 Three buildings make up Canada's parliament complex. The centre block, with its distinctive Peace Tower, houses the Senate and Commons chambers. Visitors can watch either chamber in action, take a tour of the building, and climb the Peace Tower for a view of the capital city region. The historic east block contains the restored offices of Canada's first prime minister, Sir John A Macdonald, and other early statesmen. Visitors can enjoy tours of these historic rooms. The west block contains the offices of members of parliament, and is not open to the public.